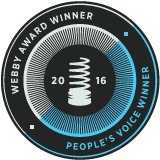 FactCheck.org, the nonpartisan, nonprofit “consumer advocate” for voters, has been awarded the Webby for best Political Blog/Website, and has also received the People’s Voice Webby in the same category, thanks to its readers. Known as “the Oscars of the Internet,” the Webbys, now in their 20th year, annually honor the best of the Internet and are presented by the International Academy of Digital Arts and Sciences. This marks the third consecutive year that FactCheck.org has won both awards. FactCheck.org is now a seven-time winner of the judges’ Webby award for best politics site, and a nine-time winner of the People’s Voice award, as voted by the public. FactCheck.org is a project of the Annenberg Public Policy Center of the University of Pennsylvania. The other finalists for best Political Blog/Website were The Nation, the Council on Foreign Relations’ feature “The Eastern Congo,” Bloomberg Politics, and past winner Truthdig. The 2016 Webby Awards received nearly 13,000 entries from all 50 states and more than 65 countries. Read more on FactCheck.org’s site here.